Remember a while back when I announced that my little sister moved to California, and that I would be designing her place? Well, fast forward a couple of weeks, and the finished product is here! To read about the beginning of the interior design story and to see the bare room, go here. But, basically, my sister moved to the San Francisco Bay area which is ridiculously expensive. Her apartment is a modest 400 square feet, and the 220 square foot main area needed to include dining, bedroom and living! 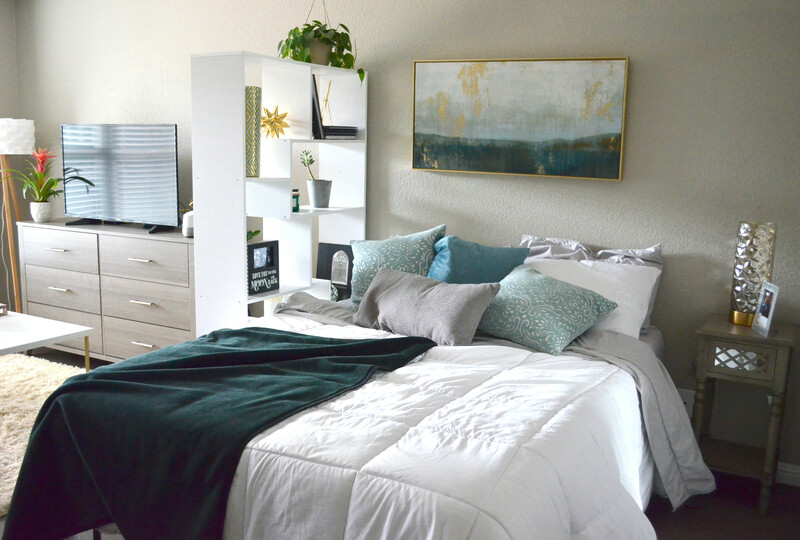 This room started from scratch: no art, no furniture, no decor pieces. All lighting, furniture, decor, bedding, flooring, etc was under $2,000. Even though the main room is only 220 square feet, all living spaces fit perfectly into the space with plenty of flow, access, and clear separation to each area. Notice how the color schemes help to provide further delineation of the different spaces of the room. The biggest compliment that was received for this space-- My sister's boyfriend came to visit and stated that while their place in North Carolina was much much larger, in many ways, he preferred her cozy studio apartment. The rest of the pieces came from Homegoods, Amazon, Ross, and Orchard Supply. This was a TON of fun. It's interesting familiarizing with someone else's aesthetics and bringing it into reality. The 2 most important lessons from this experience? Interior design is a lot about planning. By this, I don't only mean the floorplan but also the height and size of furniture and how it relates to the other furniture pieces. Is the rug appropriately sized? Is the side table the correct height? Is the table lamp the right height for the user and for the table? etc, etc. Second lesson is that interior design is a lot like art. The colors must play well together. Proportions, placement, textures, patterns, styles, etc should be balanced. And, it's so satisfying seeing all the pieces play together at the end. Also, from this, I've noticed the 3 most common mistakes of interior decorating. First, most homes lack a color scheme in the room. Second, furniture sets are a big no-no. Everything should NOT be in the same wood/metal and the same style. Finally, texture and pattern provide needed depth to the space. So, now I want to know. What do you think? With bated breath, do I get your approval? This was so much fun, that I'm already planning 2 more projects in entirely different styles!